years that the meeting will be held in Chicago, which is also the home to AALL. Chicago-Kent librarians and faculty will be very active in this year’s conference, speaking in programs, organizing events and welcoming law librarians from around the country to our city. If you’re attending the conference, we hope you’ll find the sessions listed below helpful and of course you are welcome to tour our library in person or attend events like the CALL trivia night! As the legal community and our profession continue to undergo massive change, let’s see it as an opportunity and react positively. 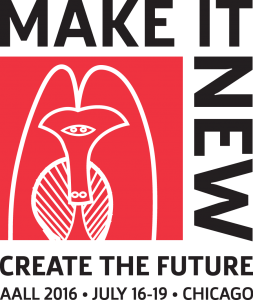 I chose Make It New: Create the Future for our 2016 theme to highlight the fact that we are the knowledge professionals who have more skills than most of our colleagues in the organizations we serve. We are the people who can truly help move our organizations forward into the future, so let’s do it. Look around your organization to see what you can do to help solve its challenges, and then share your successes with all of us. Chicago-Kent librarians and faculty are presenting on a wide variety of research and technology themes at this year’s conference. Debbie Ginsberg was also very active in the Annual Meeting Program Committee that reviewed all the proposed sessions. Sessions below are listed in chronological order – click on titles for session details. Any AALL 2016 attendees who are interested in touring our library are very welcome to stop by our service desk to pick up a self-guided tour as part of the Law School Library “Open Houses” event. Two Sides to the United Nations: Working with Public and Private International Law at the U.N.
Clare Gaynor Willis has helped organize the CALL Trivia Night on Sunday, July 17 at Timothy O’Toole’s Pub at 8pm, an event with teams of librarians competing and local Quizmaster Dave acting as MC. Scott Vanderlin will also be representing the Chicago Association of Law Libraries with an interactive trivia game at their display in the exhibition hall – stop by to test your knowledge of Chicago’s History, Geography, Entertainment, Science & Nature, and Sports! This entry was posted in Chicago, Chicago-Kent, Legal and tagged AALL, conferences. Bookmark the permalink.